Virginia Rails live in wetlands throughout North America, where they are more frequently heard than seen. To adapt to life in dense vegetation, the body of the rail is laterally-compressed (i.e. "thin") and forehead feathers with modified tips to reduce wear. Virginia Rails can swim and fly, but when in trouble members of this family are more likely to run; in fact members of the rail family have the highest ratio of leg muscles to wing muscles of any bird. See other amazing images of this Virginia Rail taken by Gregg Thompson here, here, and here. 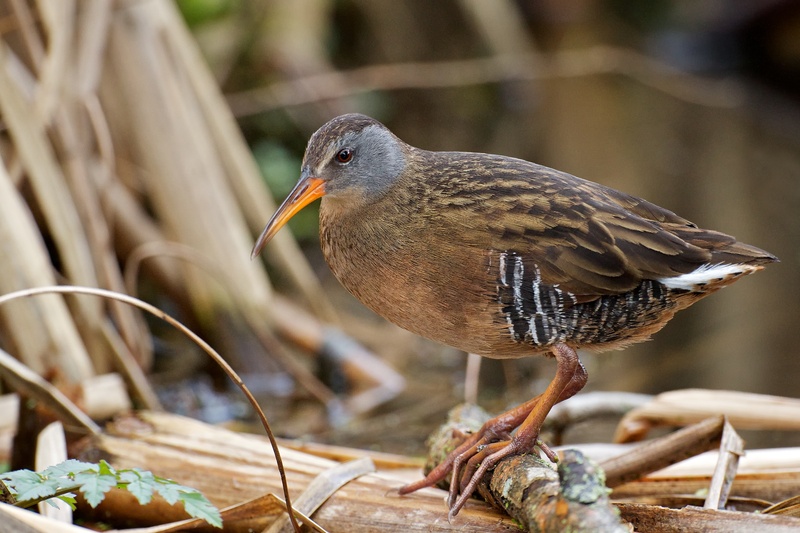 Listen to BirdNote shows: "The Elusive Virginia Rail" and "A Virginia Rail on Michigan Avenue."